Honest Trailers and Hotels.com - One is honestly obvious, the other is obviously honest. I forget which one is which, but half the fun for me was bringing these two together. And hey, it won an award, too. The best response possible for a piece of online content: Youtube Commenters didn't hate it. While I worked on Captain Obvious' Twitter account, we more than trippled our followers with consistent engagement. Here's some good ones. Skydiving without a parachute is a once in a lifetime experience. You can always tell someone is lying when what they’re saying isn’t true. If the shoe fits, it’s the right size. If your eyes are bigger than your stomach, you have severe physical deformities. Redwoods are the tallest trees in the world. They get this way by growing higher than any other type of tree. A popular tweet for engagement we did around March Madness. 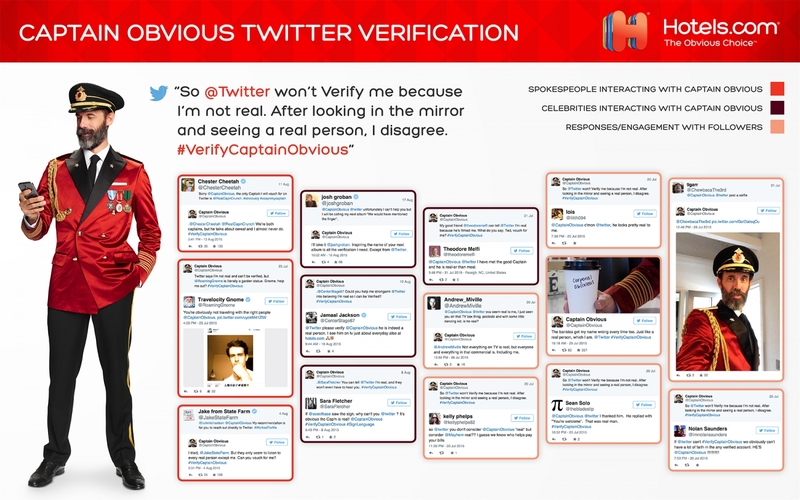 We wanted @CaptainObvious Verified by Twitter, but Twitter told us they wouldn't because he isn't real. When we told our expansive Twitter following about this decision, thousands of regular people, celebrities, and even Adweek agreed that the Captain was the real deal.